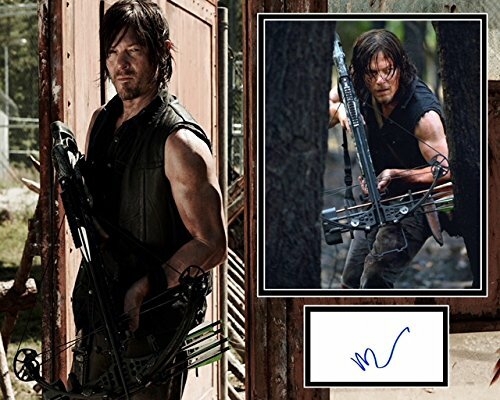 You are viewing a 20x16 photo mount, a 8x10 photo and a signed card by Norman Reedus, please ignore plastic in image as used for protection for delivery and does not affect actual item, all mounted, Welcome to Signing Dreams Autographs, authentic and original signed memorabilia from the world of film, TV, Music &; Sport. We pride ourselves in being In Person dealers, and we are out collecting in the UK and USA, throughout the year in all weathers gaining genuine in person signatures of film, music and sports stars. We are UACC registered dealer # 242 and have been dealing in celebrity autographs for the last 15+ years. We are out collecting every week, so our stock is constantly changing. All of our signed items come with a Certificate of Authenticity, produced, signed and dated by us. We now have our COA's online too, so you can see the item you have purchased along with a unique number. A vast majority of our stock is obtained by us, around 80%, at different awards events, premieres, TV shows and theatres from the UK, Europe and USA. We make several trips to America throughout the year, to gain genuine in person autographs, but couldn't possibly get everything ourselves so we do buy in stock too, but only from reliable in person dealers who we personally collect with when we are out on our trips. Please note these are actual autographs of the celebrities and NOT a reproduction pre print Shipping rates: UK recorded delivery - From £2.40 Worldwide signed for - From £8.50 We have built up a very good reputation over the years for providing a fast, efficient service to our customers, offering genuine autographs for sale. All items are sent in a hardback envelope, we are out collecting daily, so please be patient if you ask a question about an item and we do not reply immediately.